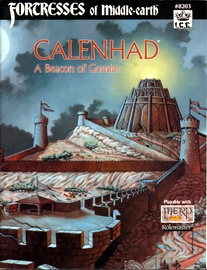 Located in the northern foothills of the Ered Nimrais, Calenhad is one in a chain of seven beacon-towers. Its watch-fire relays warning to Minas Tirith of any attack on Gondor's frontiers. Whether a Dunlending invasion from the west, an Orcish raid across the Anduin, or civil strife within Calenardhon, the tower's beacon is set ablaze. Calenhad's elevated site on steep cliffs originally sported just a rude signal-platform. The structure's fire-cage, when set alight, warned nearby Gondorian settlements of incursions by Dunnish tribes. Centuries later, when Easterlings raided across the Anduin, a more formidable tower was built over the platform's ruins. As the Shadow in Mordor grew, the tower was expanded and strengthened to become a fortress of considerable military significance. Over 20 pages of layouts, illustrations, and perspectives. Complete, multi-level floorplans for 4 guard-towers, the gatehouse, and the impressive beacon-tower. Typical layouts for watch-towers on the outer curtain wall and the wall-towers overlooking the inner bailey. Room by room descriptions and adventure suggestions. Statistics for the garrison of Calenhad and important NPCs residing in the beacon's vicinity. The palatial Halls of the Elven-king cut deep into a hill in northeastern Mirkwood. Facing southward, the main doors of this wondrous delving look onto a stone bridge that spans the swift-flowing Forest River. This strategic crossing joins the great Woodland Realm ruled by King Thranduil to the north with the haunted woods to the south. Besides guarding the bridge, the fortified subterranean palace serves as both the capital to the Wood-elves and gateway into Northern Mirkwood. Here the Elven-king greets the rare travelers who journey westward. Few sojourn beyond the Halls, however, for the Woodland Realm remains an enchanted land shrouded in mystery and threatened by the dark forces spawned by the Lord of the Rings. Over 20 pages of layouts, perspectives, and illustrations. A complete cutaway view of the Elven-king's underground City. Background and stats for Thranduil, Legolas, and the Elven garrison. Fountains and gardens line the broad avenues of Minas Ithil - the marble city where poets, scholars, and artists rival the craftsmen, shopkeepers, and clerks in both numbers and influence. Admired by all Gondorians as the pinnacle of beauty and wisdom, Minas Ithil was founded in the Second Age. She has weathered the centuries well, but the Great Plague tarnished the image of perfection. Her back streets are rutted and dirty, and thieves lurk in their deepening shadows. Yet the lofty spire of the Tower of the Moon still brings hope and pride to Ithiliean hearts, reminding all of its Seeing-stone, the source of the city's spirit. 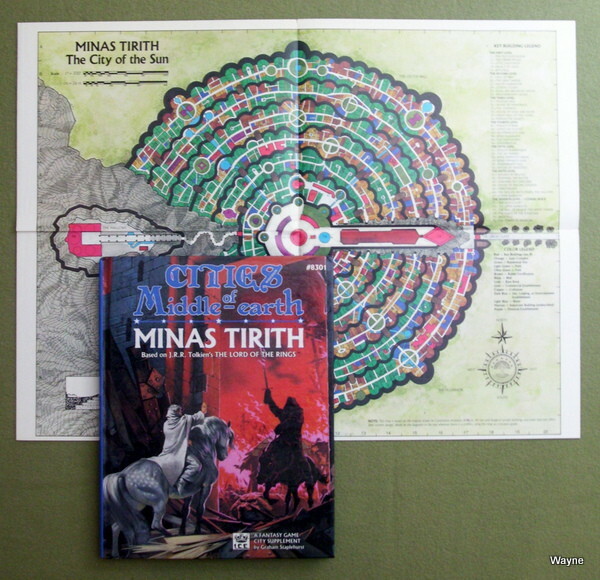 HUGE 34" x 22" FULL-COLOR MAP in two parts, depicting the city of Minas Ithil. 30 PAGES OF FLOOR PLANS, layouts, and perspectives. DETAILED DESCRIPTIONS of the key structures and sites of Minas Ithil, including the inspiring Tower of the Moon and the fabulous guard-fortress Tirithos, as well as many lesser buildings such as taverns, residences, shops, and adventure locations. 3 CHALLENGING ADVENTURES in the City of the Rising Moon, including a bureaucratic wrangle with the guardians of the palantír, a murderous mystery in the Quarter of Wells, and a hypnotic encounter with the insidious Spider Cult. IN-DEPTH INFORMATION on the politics, trade, military, history, and culture of Minas Ithil. STATS AND BACKGROUND INFORMATION for the city's prominent leaders, including Queen Mírien of Gondor, the Stone-warden, and the Steward. "Minas Tirith, the Guarded City, rises from the base of Mount Mindolluin. Capital of Gondor, it is the preeminent symbol of the struggle against Sauron of Mordor. No other city in western Middle-earth offers greater hope for the defense of the Free Peoples. Minas Tirith commands the wide gap between the White Mountains and the Mountains of Shadow that encircle the Dark Lord's homeland. Its seven walls and seven levels seem to grow out of the stone, as if carved by Giants. Each tier of the Royal City wraps around the rock and looms above the surrounding quarter, its ramparts glimmering white with each sunrise. High atop the capital, on the uppermost level, the Tower of Ecthelion reaches skyward like a pearl-and-crystal spire. Amidst the storm spawned by the Lord of the Rings, this citadel is the last hold in Minas Tirith, an unparalleled bastion in an ominous time. Descriptions of Boromir, Faramir, Denethor, and other famous figures"
Near the source of the Sîresha in Greater Harad stands a hollow mountain - Ny Chennacatt. It is sculpted to resemble a Dragon's head and houses the army of Akhôrahil, the Ringwraith. Composed of disciplined Haradan warriors and ferocious Orcs, the hosts are poised to hold all the lands south of Mordor under their sway. The Nazgûl plots to render this vast fief up to the Dark Lord's sovereignty. OVER 40 PAGES OF LAYOUTS and illustrations. COMPLETE MULTI-LEVEL FLOORPLANS of Akhôrahil's vast citadel: Ny Chennacatt. DETAILED DESCRIPTIONS of the key structures and sites of Ny Chennacatt, including the awesome chasm of Naria and the dread-inspiring Throne Room. 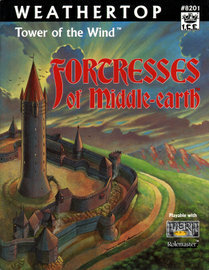 ROOM-BY-ROOM DESCRIPTIONS of the lesser, but necessary, chambers of the fortress, including barracks, mess halls, Orc warrens, the elevator, the cisterns, and the five formidable Tier Fortresses. TYPICAL LAYOUTS for the crazy assortment of towers sprouting from the slopes of the mountain fortress. 4 UNUSUAL ADVENTURES in Ny Chennacatt, including a trading exhibition, a risky mission of stealth, a bold foray into Akhôrahil's arena, and infiltration into the Nazgûl's army. STATS AND BACKGROUND INFORMATION for the prominent leaders in the fortress, including the Fifth Nazgûl and his brilliant general Wyatan. STATISTICS for the Army of the Southern Dragon, quartered at the citadel between military campaigns. Two of the most fearsome towers in all of Middle-earth, the Teeth of Mordor guard the entrance to Mordor, land of Sauron. The fortresses were erected by Gondor to prevent evil creatures from returning to the Black Land. After the Great Plague, it was repopulated by the very Orcs and Trolls it was designed to forbid. Nearly two hundred feet tall, the Teeth are known individually as Carchost (s. "Fang-fort") and Narchost (s. "Fire-fort"). These towers and their connecting rampart commands the gap between the Mountains of Ash and the Mountains of Shadow. Chiseled of smooth and glassy slag, they erupt from the tortured plain like huge ebony jaws poised to close upon the foolish intruder. Complete, multi-level layouts for Carchost, Narchost, and the central gate complex. Garrison data for both Gondorian and Sauronic forces. Stats and background for the Mouth of Sauron and Dwar of Waw, Nazgul commander of the Morannon. The citadel that crowns Weatherop (S. Amon Sûl) is the greatest tower-fortress in Arnor and the focus of much of the struggle between Arnor's three successor kingdoms: Arthedain, Cardolan, and Rhudaur. Built by the Faithful Númenórean exiles led by Elendil the Tall in the late Second Age. it rises from the heart of Dúnedain's Northern Kingdom. The royal tower houses the Chief Palantîr (Seeing-stone) of the North and serves as the principal home of Arnor's High Seer. Few fortresses hold such significance; for its size and strength, Amon Sûl is unsurpassed by any other work of northern Dúnedain. Even the Witch-king of Angmar looks to the Tower of Amon Sûl as a great prize, a preeminent symbol of Dúnedain spirit. 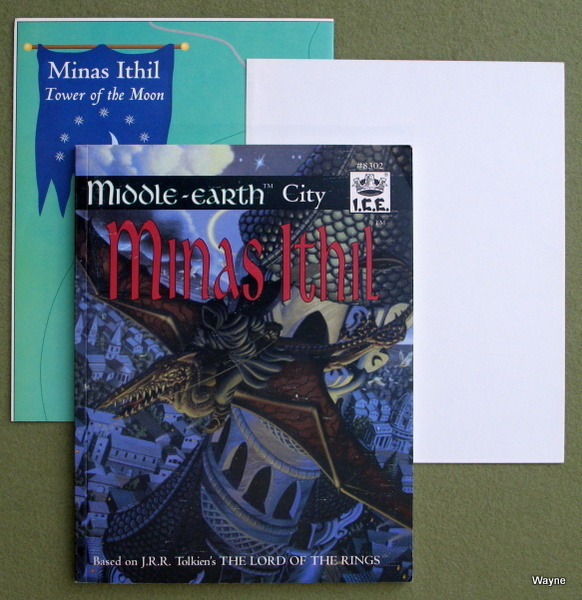 Minas Tirith documents the history, design, layout, garrison, and inhabitants of the Guarded City, preeminent symbol of the Free Peoples' struggle against Sauron of Mordor. The capital of Gondor commands the wide gap between the White Mountains and the Ephel Dúath that encircle the Dark Lord's fief. Its seven walls and levels seem to grow out of the mountains' stone, as if carved by giants. A PAIR OF FULL-COLOR MAPS - each depicting half of the incredible City of the Guard. Beautifully rendered by the artist responsible for the maps of Endor's varried terrain. KEY LOCATIONS - the Great Gate where Gandalf halted the Lord of the Nazgûl, the Houses of Healing where Éowyn and Merry suffered under the Black Breath, and the Place of the Fountain in the High Court where Queen Arwen sang of Valinor. ROYALTY - Tarondor, his family, and the Kings who shaped the design of Minas Tirith. FLOORPLANS - detailing over forty edifices standing within the city walls: the Keylodge, the Great Bakery, the Waterwrights' Hall, the Rynd Permaith Iaur, and more. DENETHOR & HIS HEIRS - the Last Ruling Steward of Gondor and his sons, Boromir and Faramir. CITY LANDS - the Pelennor (the enclosed slopes and terraces surronding Minas Tirith), the banks of the Anduin upon which rest Harlond, the South-haven where river traffic docks, and the vales of the White Mountains, wild and alpine in character. ADVENTURES - confront a beguiling traitor, a false rebel, and a corrupt sorceress. 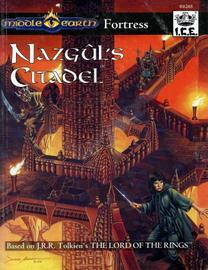 This volume of the Citadels of Middle-earth is a revised version of the sourcebook released in 1988. 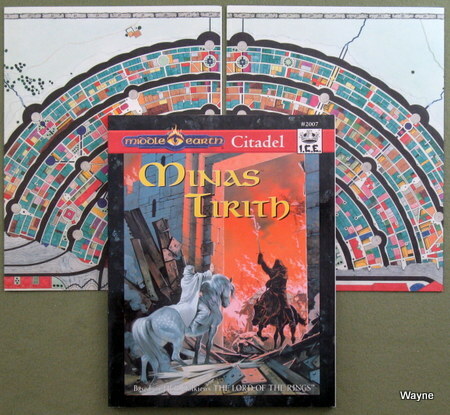 The revised Minas Tirith features a new city map - so large it requires two separate halves - and includes complete stats for the Lord of the Rings Adventure Game in addition to MERP and Rolemaster stats. Dol Guldur documents the history, design, layout, garrison, and inhabitants of the Hill of Sorcery, the volcanic stronghold in Mirkwood. The cinder cone looms over a vale strangely quiet and barren amidst the forest. No birds fly across the Nan Lanc, the Naked Valley, and thistles and briars comprise its vegetation. Within the mountain, intricate pits and chambers tunnel deep into the earth, and a maisma of evil coils amidst the shadows. This all-new volume of the Citadels of Middle-earth series presents over 20 pages of maps and floorplans detailing the Necromancer's awful lair. 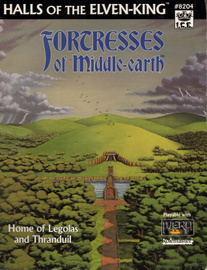 It includes complete stats for MERP, the Lord of the Rings Adventure Game, and Rolemaster. CROSS SECTION OF THE CITADEL - showing the Precipices, Levels, and Strata of Dol Guldur, and where they fall within the volcano Amon Lanc. 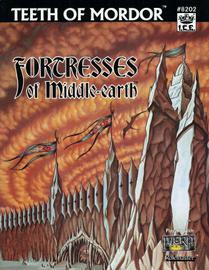 KEY LOCATIONS - the Front Gate (called Madhûm by the Orcs), the strategic Web enclosing the Seventh Level, the Bagalaukan that collects the fetid slurry of the stronghold's privies, the severely beautiful Necromancer's Halls, and the deadly Fifth Stratum where the Overlord of Dol Guldur reposes in searing, sulfur-laden steam. FLOORPLANS - of Celedhring's domicile, the Slave-master's residence, the halls of the Mouth of Sauron, the Necromancer's Vantage, and many more. LORDS AND OVERLORDS - Khamûl the Nazgûl, the Mouth of Sauron, Dol Guldur's High commanders, and the Necromancer himself. ORCISH DEVICES - rail-cart tugs, stair lifts, and the Dhaumabrukul (the Wheel of Pain) are but a few of the mechanisms employed by the Orcs of Dol Guldur. ORCISH TRAPS - drain-chutes, fume-chambers, mud-pits, steam-jets, and numerous other traps threaten the survival of intruders. HISTORY - tales like that of the first inhabitants of Amon Lanc, the Dwarves of Drúin's Tribe, and their subtle eviction by the Dark Lord's minion, Celedhring. INTO THE DARKNESS - a three-part mini-campaign involving a tricky rescue attempt to pluck an important prisoner from the Necromancer's grasp before her captors leave Dol Guldur's outposts and reach the innermost dungeons of the citadel. -Upper left panel: Regional map, with Arthedain in NW, Cardolan in SW, Rhudaur in NE. -Lower left panel: Area, dominated by Lorien forest. 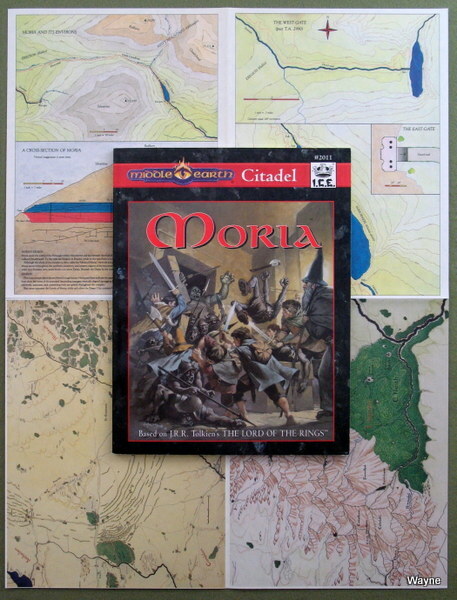 -Upper right panel: Moria and environs/Cross-section of Moria. -Lower right panel: The West Gate & Dimrill Dale. "Moria, the 'Black Chasm,' lies deep in the bowels of the Misty Mountains. Here Durin's Folk, the oldest of the Seven Dwarf-houses, sculpted the vast city and endless mines of Khazad-dûm, the largest fortress ever constructed by the Free Peoples. Its stairways climb to the starry heavens and descend to depths unknown and terrible; its countless bridges cross bottomless pits and enchanting canyons; and its wonderfully-embellished vaults guard untold riches, including mithril: the enchanted "true-silver," the most priceless of all metals. Shrouded by an unspeakable curse - a foul, wicked legacy of original evil - this awe-inspiring marriage of singular natural and Dwarf-made wonders presents one of the greatest settings for exploration and adventure in all of Endor. FULL-COLOR MAPS of Dimrill Dale, the headwaters of the Sirannon, and the spires above Moria: Redhorn, Cloudyhead, and Silvertine. CROSS-SECTION OF THE STRONGHOLD depicting the core of Khazad-dûm, its sprawling mines, its Deeps and Levels, the Endless Stair, and the unfathomed Under-deeps. STONE MAPS portraying the complex network of avenues, roads, accessways, and mineways that connect Moria's myriad armories, ceremonial chambers, dungeons, gathering halls, and treasures. KEY LOCATIONS - the hidden West-gate, outside the enchanted doors of which Gandalf searched his ancient memory for the word which would open the portal; the Chamber of Mazarbul where Frodo stabbed a Cave-troll with his blade Sting; and the Unending Well bridged by the narrow span where Gandalf confronted the Balrog. FLOORPLANS for the Second Hall of the First Deep, the East- and West-gate, the Chamber of Records, the King's Armory, the Cold-forge, the Balrog's Lair, etc. SMITHIES where precise recipes for smelting, fire-forging, and cold-forging produce ingots, coins, and artefacts of unparalleled quality. TRAPS - the perilous devices with which the Dwarves guard treasured or sacred places in their cavern home. 6 ADVENTURES AND 3 EPISODES - confront treason amid the hotbed of political intrigue that comprises the royal court of Khazad-dûm under King Báin; accompany an aged Dwarf into abandoned Moria on an expedition seeking ancient treasures and heirlooms; learn the mystery of the Under-gates in the baffling Dwarven runes that hint at a Stone of Closing forged by Durin's Folk long ago. This citadel module is a revision of ICE's acclaimed 1984 campaign sourcebook. 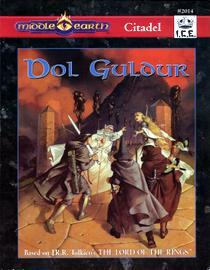 Beside containing a host of new material covering everything from the wind-swept Redhorn Gate to the fiery Under-deeps, it provides statistics for MERP, Rolemaster, and the Lord of the Rings Adventure Game." Color fold-out map is double-sided. Front has an area map on the left side, and a map of Laketown on the right. Back has 4 B&W maps of towns: Buhr Chep, Dale, Cotstow, and Lindaroth-by-Lindal. "Explore the Northron settlement where Bilbo and the Dwarves were feasted and supplied during their journey toward Smaug the Dragon! Moor your boat at the town's quays, search for exotic goods from the East in the stalls of its Great Wharf, or witness the changing of its formidable Bridge Guard accompanied by the retrieval of the hlaestingas, the collected trade tariffs. Lake-town presents this merchantile center in all its vivid bustle, including craft associations, the burg's coiner, drihten who collects the tools, and smugglers. An introductory adventure followed by a two-part mini-campaign draws player characters into the watery labyrinth amidst the piles below the town's wooden streets and out into the wild lands surrounding the Long Lake. In the aftermath of the Plague, Orcs and Trolls and Undead have the upper hand in the Wilds. Keep you hand on your sword hilt, if you venture far from Esgaroth! 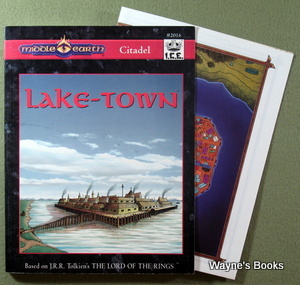 Lake-town includes complete stats for MERP and Rolemaster. COLOR MAP - depicting the Northron settlement in vivid hues. THE BODY IN THE WATER - acquaint yourself with Lake-town by paddling through the forest of piers supporting the town's platform in search for the link between the charnel house corpse and a barrel of spilled barley. HISTORY - from the days of quaint stilt-houses, through the years of the "Reed-delving", the Great Plague, and the Wainrider onslaught, to the Golden Age when Dwarves brought the trade and wealth that tempted the Dragon Smaug to fly south to the Long Lake. THE MAESTA OF ESGAROTH - the Master who treats with Lake-town's enemies and allies and mediates between disputing craft edfreahir. LAKE-FOLK - Bedarof the Guard-lord, Saewis the Boat-wright, Bogatung the Wyrdwoman, Hildagrippa of the Erannun Inn, and many more. HIGH-HOUSES, GROGHALLS, & WARESTORES - the buildings that stand on the immense platform supporting Lake-town, presented in over 40 detailed maps and floorplans. TWO HEADS ARE BETTER THAN ONE - venture into the Wilds surrounding Lake-town to confront a most unusual Half-troll and her voracious appetite; then race against the Cruel One of the Woad." All MERP products Copyright © TOLKIEN ENTERPRISES, a division of ELAN MERCHANDISING INC., Berkely CA. Middle-earth PBM, The Hobbit, The Lord of the Rings, and The Return of the King, all characters and places therein are trademark properties of TOLKIEN ENTERPRISES. All characters and places derived from the works of J.R.R.Tolkien are common law trademarks used under license from Grafton Books (Harper Collins), publishing successors to Unwin Hyman, Ltd. and George Allen & Unwin, Ltd., London, UK.